Get rid of your phone bill and antiquated, expensive phone system and let CrownTech provide you hosted phone service with zero up-front cost and only a low monthly fee that includes phones, setup, minutes, training and support. CrownTech’s 3CX platform is a true Enterprise PBX, unlike other hosted platforms that were designed with a limited feature set for use by individuals or small businesses. And CrownTech supports its phone service with a responsiveness and expertise uncommon among phone service providers. 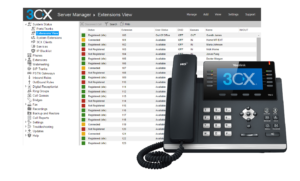 3CX Phone System for Windows is an award-winning software-based IP PBX that replaces traditional proprietary hardware PBX. It is based on the SIP standard and supports most popular SIP phones, VoIP Gateways, VoIP service providers and PSTN phone lines. It is easy to manage by system administrators as it integrates well with Windows Network infrastructure. Call 770-888-0901 or email to discuss what CrownTech and 3CX can do for you.